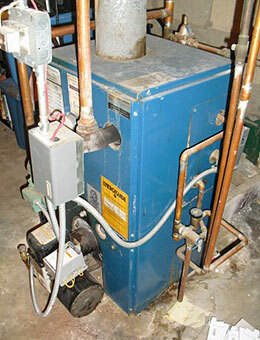 Existing - 23 yr old, 75% efficient oil boiler. 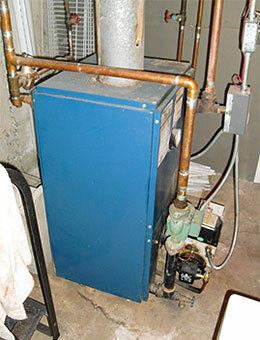 This Boxford, MA boiler had reached a point that it was leaking and out of service. To be replaced with a PURE-PRO P-4 140,000 BTU, 86.1% efficient w / Riello F-5 Oil Burner and HTP SuperStor 45gal Indirect Water heater, 3 new TACO circulators and “Trim Kit” expansion tank. Installation will include new piping from the boiler to existing heating zones with new connection piping to the indirect water heater. The boiler will be vented into the existing chimney with new smoke pipe and flue connection with a new damper. * Job included: Installation of all new equipment, proper removal and disposal of existing equipment and debris, and all permits and inspection fees. 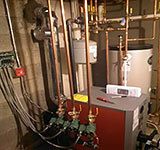 SIMMONS PLUMBING & HVAC to the rescue on this Boxford, MA project ! 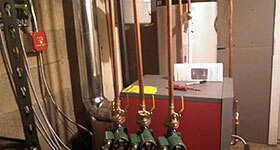 Installation includes a FREE inspection of equipment in the next 12mos.Customer must call for the appointment. Warranties: 1 year warranty on WORKMANSHIP and ALL NEW PARTS needed for installation. Pure-Pro issues a Limited Lifetime Warranty on the Boiler Sections, 5yr on Riello burner and 1 yr on ALL parts. HTP SuperStor issues a Lifetime warranty against leaks. By choosing this 86.1 % efficient system the customer also qualified for the Mass Save Loan.